Is there any remaining doubt that Rough Crafts is one of the world’s top custom builders? 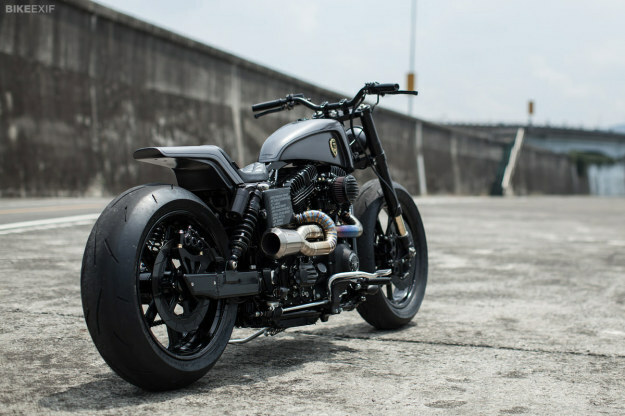 On the evidence of this Harley-Davidson Dyna, I don’t think so. 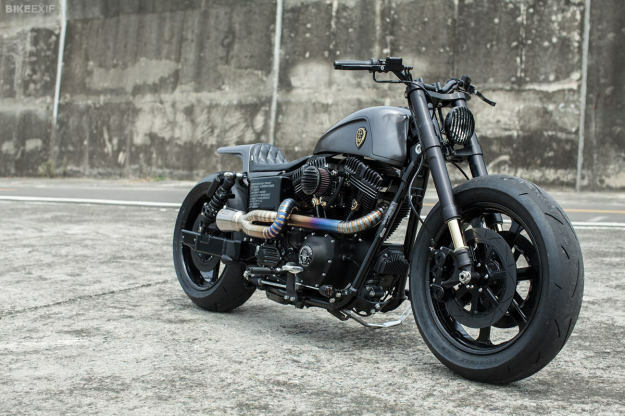 ‘Urban Cavalry’ is not your typical Harley build. For starters, it’s an official commission—a gift to the custom scene from the folks at Harley-Davidson Taiwan. Even better, they gave Rough Crafts’ Winston Yeh the freedom to pursue his own direction, and he chose performance. To ramp up the dynamics, Yeh has fitted a complete new front end, with upside-down Kawasaki sportbike forks supplied by Satya Kraus. “Satya has been a great friend for several years now,” says Yeh. “And I’ve always loved his Dynamoto Front End kit with Öhlins forks. We’ve fitted a shorter custom version of that kit to improve the stance, and blacked-out Öhlins shocks at the back.” Yeh also installed an aluminum swingarm from Roaring Toyz and a BDL open belt drive, both of which reduce weight even further. The brake system is equally high end. 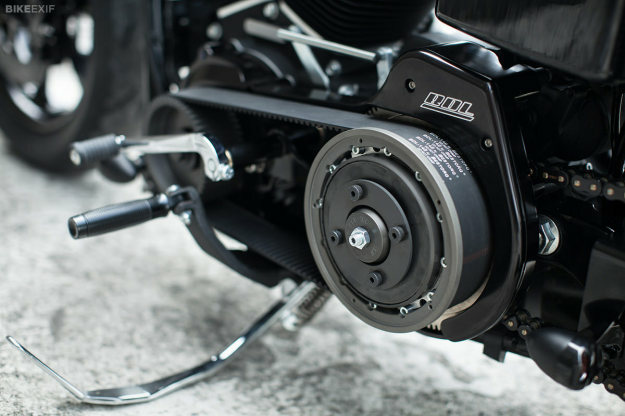 The dark metal composite rotors were custom-made by the US firm Lyndall Racing Brakes, and they’re hooked up to six-piston calipers from exotic Swedish brand ISR. Brake fade will never be an issue. The stock Dyna has a surfeit of torque, so the powertrain upgrades are restricted to the engine breathing. The 103 ci (1689 cc) motor gets a boost from S&S ‘Super G’ carburetion—plus a quite extraordinary exhaust system. It’s from Dog House Racing, Taiwan’s premium titanium exhaust fabricator. 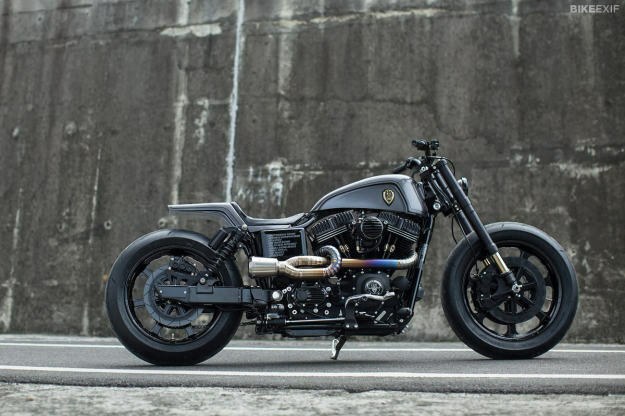 Despite the new-found focus on tearing up the asphalt, the Dyna is the best example yet of the stunning Rough Crafts ‘look’. With a narrow custom tank and a superbike-inspired tail unit, there’s a distinct air of vintage sci-fi. It’s the kind of machine you could imagine racing through the streets in Blade Runner. The finish is almost entirely monochrome, with black anodized hard parts offset by semi-gloss grey paint from Air Runner. 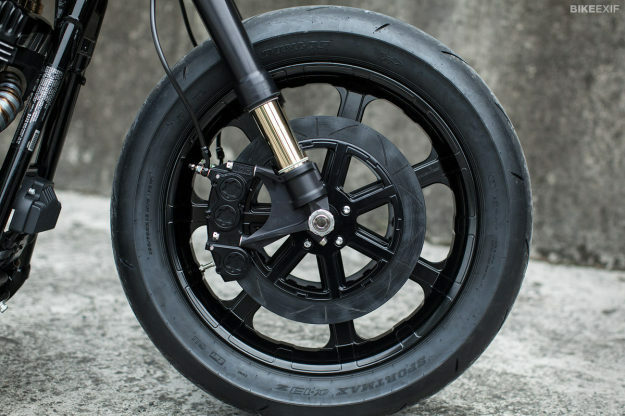 Even the Arlen Ness Beveled Wheels, 18” at the front and 17” at the back, have been completely blacked out. 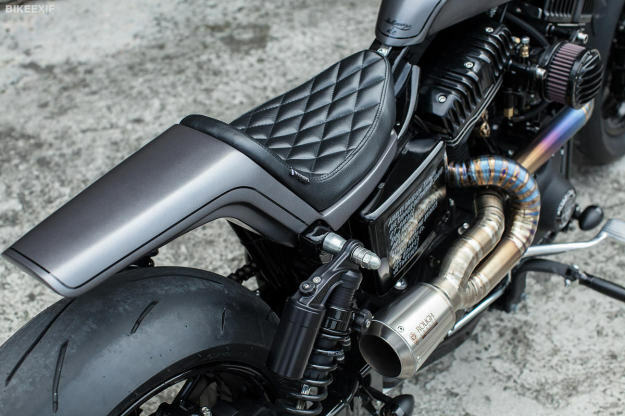 The only glimpses of color are the titanium exhaust pipework, the fork tubes, and tiny brass highlights on the pushrod collars made by 2 Abnormal Sides. 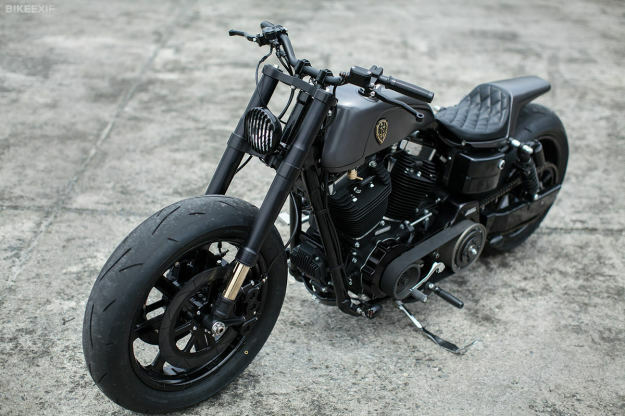 I wouldn’t call myself a Harley guy, but I’d be happy to have this Dyna in my garage. Correction: I would gladly sell a close family member to put this bike in my garage. Top marks to Rough Crafts for another out-of-this-world build.